Despite the Scottish heritage of whisky drinking, Presbyterians were strong supporters of temperance and prohibition. They believed (with some justification) that 'the demon drink' was destructive of family life. 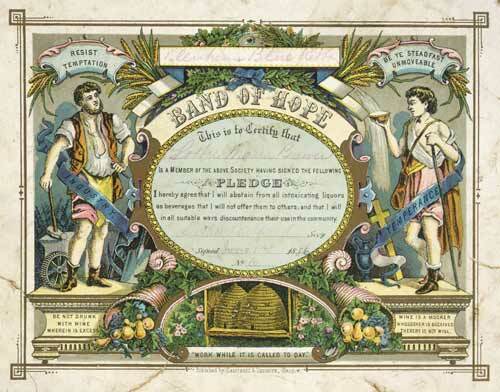 The church was a stronghold of the temperance organisation the Band of Hope, founded in the 1840s, which encouraged young people like Lottie Maria Brewer of Blenheim to sign a pledge to abstain from alcohol. Teetotallers also persuaded the church to use grape juice rather than fortified wine in the sacrament of communion.